Students and school nutrition staff activate their taste-buds in preparation for the Child Nutrition and Product Expo on Oct. 11 from 9 a.m.-1 p.m. through Harris County Department of Education’s Choice Partners Cooperative. The “Lights! Camera! Nutrition!” retro, Hollywood-themed event features 140 food and product vendors at the Humble Civic Center, 8233 Will Clayton Parkway in Humble, Texas. About 250 nutrition directors and representatives from school districts, charters and community colleges participate in the expo. 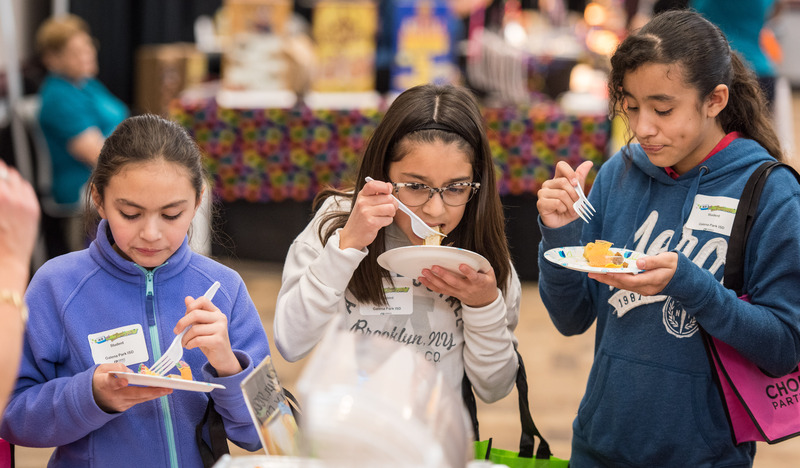 They bring an estimated 150 students along to taste-test their products which may eventually make their way into the Choice Partners purchasing cooperative. Students and directors grade the vendors’ offerings. • Hand-held, food-truck type items and culturally-influenced foods with distinctive spices for flavoring. MCI Los Cabos introduces three flavors of a handmade, one-fisted, foil-wrapped, taqueria-style burrito for authentic look and taste. Rich Products provides a new whole-grain flatbread for making banh mi street tacos or gyro sandwiches. • Clean-label items with no artificial colors or flavors, free of nitrites/nitrates, gluten, MSG, hormones or steroids and void of the top eight allergens. • Jennie-O Turkey Store delivers an all-natural line, which includes a turkey burger and turkey coins, pre-sliced and fully cooked. “As the school nutrition directors evaluate nutritional value and their students’ opinions, Choice Partners gathers information needed to plan for future food contract purchases for school districts,” said Trisha Jensen, assistant director of Choice Partners. Food is purchased annually by school districts in the Harris County area for more than 85 million student lunches through contracts available through HCDE Choice Partners cooperative. Choice Partners purchasing cooperative offers quality, legal procurement and contract solutions to meet government purchasing requirements. For more information about Choice Partners and the buying power through the co-op, go to www.hcde-texas.org.